In the frontal impact, the driver's inboard seat rail was found to have very nearly broken in two, and was mainly held together only by the threaded steel rod which controls fore-aft adjustment of the seat. The break occurred just at the point where the lower anchorage for the driver's seat belt attaches to the rail, and is thought to have been caused by the high tensile forces in the belt during the test. As a result, there was additional forward movement of the dummy which contributed to 'bottoming out' of the airbag i.e. there was insufficient pressure in the airbag to prevent the driver's head from making contact, through the fabric of the airbag, with the steering wheel rim. Jeep has investigated the cause of the seat rail failure and cars from VIN 1C4RJFJG4EC139637 have a modified design to prevent such fracture. Earlier cars have not been modified. Although dummy readings were good, structures in the dashboard were thought to present a risk of injury to the knees and femurs of occupants of different sizes and to those sat in different positions. Maximum points were scored in the side barrier test but, in the more severe side pole impact, protection of the chest was rated as marginal. The Grand Cherokee has an 'active' head restraint which senses when a rear-end impact has occurred and moves the restraint forward to minimise the time to restrain head movement. Jeep showed that the system responded in a broad range of accident severities, and the whiplash tests were performed with the system active. Nevertheless, the protection provided against neck injuries in a rear-end collision was rated as marginal. In the frontal impact, the 3 year dummy did not move forward excessively. However, on rebound, the dummy's head contacted the trim on the rear door pillar and the car lost all points for protection of the 3 year dummy in that test. The passenger airbag cannot be disabled so a rearward facing child restraint should not be used in that seating position. The dangers of doing so are not clearly labelled in the car. The bumper provided good protection in all areas tested and scored maximum points. However, the front edge of the bonnet was poor in all areas tested. In almost all areas likely to be struck by the head of a child, the bonnet provided poor protection. However, protection provided to an adult's head was mixed with areas of good and poor protection. 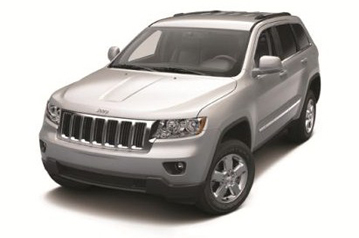 Electronic stability control is standard equipment on the Grand Cherokee and met Euro NCAP's test requirements. A seatbelt reminder system is standard equipment for the driver and front passenger seats. A sped limitation device is not offered on the Grand Cherokee.